Glass tile backsplash complements a unique inverted bowl concrete sink which as a moat that is pitched to a drain. The specialty features in this design help soften the water flow and reduce splashing on the sink. 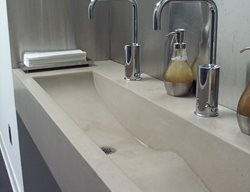 This beautiful contemporary trough bathroom sink displays the true versatility of concrete. It was fabricated with a 4’ integral trough sink with a 7” apron drop and built in concrete faced drawers. 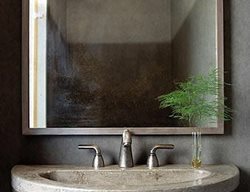 Read about all the concrete details in this bathroom. 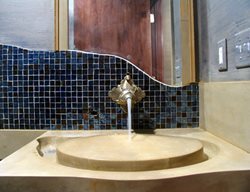 This custom designed sink incorporates a modified whirlpool faucet hidden within the backsplash, creating a unique work of art. 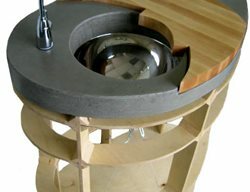 This sink shape was custom designed with the unique wave division to separate the two sides of the basin. The sink was custom colored to match the paint used in the restroom. The focus of this sink is water movement. Initially the sink looks simple, but once you turn the water on and watch it curve through the sink you’ll be amazed. 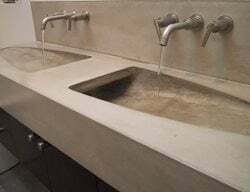 This double sink is in a restroom in a commercial building in Chicago, IL. The entire piece appears to be floating. 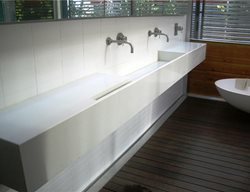 Seamless double sinks and bathtub cast in place. 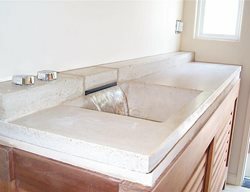 Bathtub features a concrete faucet. 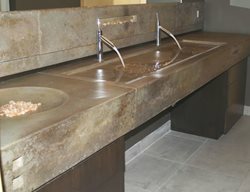 This sink is made of precast concrete. 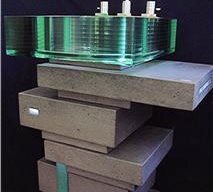 It has the shape of a box trough and is resting on thick wooden beams. It was custom colored with integral pigments and diamond polished to give it a finished look. 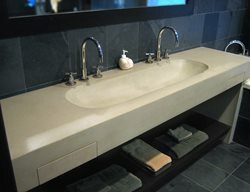 This master bathroom in a home near Menlo Park, CA features a concrete countertop with integral sinks and a concrete tub surround. Once the jacuzzi tub and cabinets were installed in the bathroom, templates were made. Back in the shop, these were used to create custom molds. The counter and tub surround were precast. The tub surround was cast in three pieces to make transportation and installation easier. 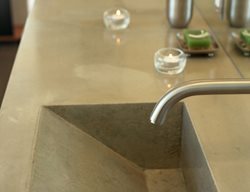 The countertop, featuring double integral wave sinks, was cast in two pieces. The homeowner requested a teal green color that Diamond D was able to match by mixing a variety of pigments. Freestanding bathroom vanity top with integral sink. This large sink is one-of-a-kind. It was cast from a custom mold that was dismantled after production. Read more about Flowstone Concrete Studio. 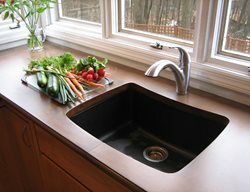 Custom mold garden sink for cutting vegetables, cast in a concrete island countertop. 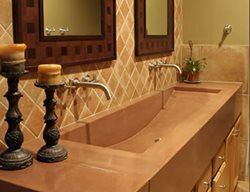 This cinnamon colored vanity top with integral potbelly sink and curved backsplash is perfect for a half bath or powder room. The cabinet below is less depth than a standard vanity top, yet the homeowner doesn’t feel they are missing out on space. This integral trough sink and back splash are done using the steel trowel method and shown in the color ochre. This vessel was handmade and then stained with water base stain and sealed. 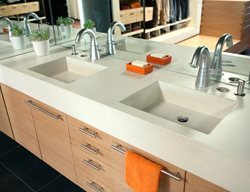 The countertop was precast with a bullnose edge and sealed with a satin finish polyurethane. 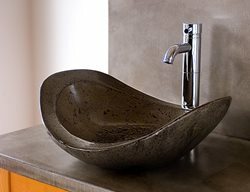 This one-of-a-kind precast sink creates a 3-dimensional look. The sink was colored to match the wall tiles of this residential bathroom. 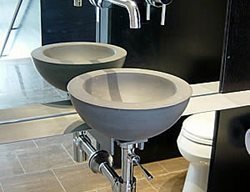 Pourfolio's signature ‘twin bloc’ basin and concrete wall that doubles as a shower wall with a cast in ‘nook’ on the reverse side for storage.